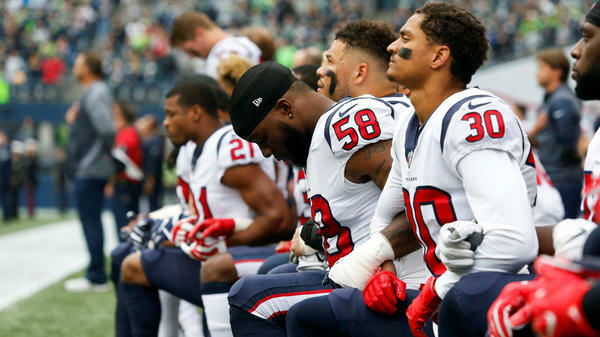 NFL players from the Houston Texans and other teams chose to take a knee during the national anthem before kickoffs in the 2017 season. Unveiling a new policy after months of controversy and debate over players taking a knee or otherwise making statements during the national anthem, the NFL says all of its athletes and staff "shall stand and show respect for the flag and the Anthem" if they're on the field. "Personnel who choose not to stand for the Anthem may stay in the locker room or in a similar location off the field until after the Anthem has been performed," the league said in its new policy. The possibility that the NFL might issue a blanket restriction on protests during the anthem has been discussed for months, and the buzz gained new momentum this week. But the NFL Players Association says that "The NFL chose to not consult the union in the development of this new 'policy.' "
The league's decision goes against what the NFL had told players "about the principles, values and patriotism of our league," the union said, adding that it will review the policy with an eye toward mounting challenges if elements of it contradict the current contract. As news of the strict policy spread, Vice President Pence tweeted "#Winning" along with an American flag and a screenshot of a story about the NFL's anthem policy. Athletes' behavior during the anthem and flag presentation became a national conversation and a political talking point after NFL players used the traditional opening of their games as a moment to protest police brutality and racism in America. That effort was led by former San Francisco 49er Colin Kaepernick, who took a knee during the anthem — and who went from being a starting quarterback to being an unsigned free agent in the spring of 2017. Despite Kaepernick's absence from the game last season, NFL teams struggled to craft coherent responses to players' desires to highlight social issues — and they also faced intense public scrutiny, including from President Trump, who condemned players who refused to stand and urged fans to boycott the NFL until teams quashed the protests. Saying that the new policy was meant to put the focus back on the game, NFL Commissioner Roger Goodell said on Thursday, "It was unfortunate that on-field protests created a false perception among many that thousands of NFL players were unpatriotic. This is not and was never the case." NFL team owners voted to adopt the policy — and while the league says the changes "were unanimously approved by team owners who voted," it also notes that 49ers team owner Jed York abstained, at least in part because York wanted the players to be involved. The on-field protests have taken many forms, from players taking a knee to sitting on the bench as others stood on the sideline. In many cases, teams' players were split on the issue; in others, entire teams took a knee — as in September 2017, when Dallas Cowboys owner Jerry Jones linked arms with his players and took a knee. But one month later, Jones threatened players, saying if they "disrespect the flag," they would be benched. The NFL's 32 teams can develop their own rules about the process, as long as they follow the new policy. "A club will be fined by the League if its personnel are on the field and do not stand and show respect for the flag and the Anthem," the NFL said. In addition, the commissioner "will impose appropriate discipline on league personnel who do not stand and show respect," the league said. Responses to the protests during the 2017 season included dueling boycotts (from fans who don't like players protesting, and from others who don't like how teams treated Kaepernick); threats to strip the New Orleans Saints team of its tax breaks; and the decision by the founder of the Papa John's pizza chain, a longtime NFL advertiser, to step down as CEO after saying the NFL had hurt his business by not resolving what he called a "debacle." In recent months, Kaepernick has been pursuing a collusion case against the NFL, accusing teams of banding together to keep him from being employed in the league. This week, a report emerged that his attorneys' investigation found documents that backed up his claim that, as he neared age 30 last year, he was good enough not only to play in the NFL but to start. Eric Reid, who was the first player to kneel alongside Kaepernick as his teammate in San Francisco, says he is also being punished for that practice, which he continued last season. At 26, he has gone unsigned despite starting at safety for five years; earlier this month, Reid filed a grievance against the NFL and its teams. "We chose to kneel because it's a respectful gesture," Reid wrote in an editorial for The New York Times last fall. "I remember thinking our posture was like a flag flown at half-mast to mark a tragedy. It baffles me that our protest is still being misconstrued as disrespectful to the country, flag and military personnel." The NFL Players Association says that its members "have shown their patriotism through their social activism, their community service, in support of our military and law enforcement and yes, through their protests to raise awareness about the issues they care about."